Thank you, I understand. I'm discovering also the old problem that soft-body physics can't be applied to rigged figures, only props. Do I export figures as obj and import as prop in Daz, same as in Poser also? A number of different Python scriptsw have been written to automate that rather dumb process--is there something similar to expedite conversion of cloth from conforming to dynamic in DS4? DAZ Studio Dynamic Cloth is rigged. However it can only be created with a pair of special tools, one of them being Optitex, which is a Professional Level Clothing design software package. Well, it's impressive how much faster actrive content loads, especially if it has morphs, and Genesis provides compatiblity with gen3 and gen4 models. However, file format compatibility beyond 3DS-level properties remains an issue, even with Daz's own product, Carrara? DIM warns DazStudio updates? It would be nice. No, at this time it monitors only content for Poser and DAZ Studio, not content fro other applications (such as Carrara) and not plugins, shaders or base applications. I'm having problems with this version. There's a bug. The mouse pointer continues to disappear, and the scenes jerk around, causing the arrow to skip from one transition to another. Just crazy behavior. This was happening on a previous version, like - back in the early 4.0 version and now, it's back again. I was in the middle of a bookcover as well. I don't want to jump into Poser to finish it, the lighting is different and it takes me too long to get things working right in there. It was/is the tablet that is invoking that behaviour for me. No I don't - but I wish I'd stayed there until I finished what I was doing. And I can't go back because then I wouldn't be able to open the characters I've made in this verison. Oh well, I'll have to close it when it starts and reopen it until I get done. I'm saving all the way, so long as I do, I can close it and reopen. A couple challenges with this update- negative scaling not working and (seemingly) longer render times. In the previous version (4.5.1.6) I could use negative scaling on an object (with a point light inside) so that it appeared to glow from the inside and now this doesn't work. Also it seems the render times (default settings) have gotten twice as long. Is there a work around within DS for negative scaling? If not I'll go ahead and report it. 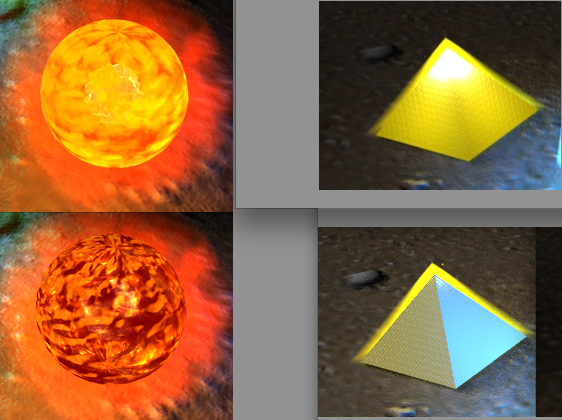 This image shows previous renders on top when the effect was working. The workaround would be to use a shader with Translucence, such as uberSurface. Thanks Richard! The Mystical Touch staffs are the solution then- They have UberSurface shader effects that I can study and duplicate for my own props. And WOW- there's 50ish sliders/settings/maps to learn for UberSurface- lots of control there, very good. I sent you an email, but the gist of it is...the negative scaling was 'incorrect' behavior...the current way is 'correct'. It was switched to fix a different bug...one that had much more of an impact and was very commonly encountered (black surfaces showing up in normal renders). But they do not load anymore with this update. Is there some workaround??? I'm rather sure they worked with the previous 4.5. Is somebody working on this (like changing the DLL's to work with the new interface or Daz supporting the old interface as fallback)? And my 4.5 crashes on rendering, but since I don't render in daz that's no problem for me. InjectPMD has not worked in any version of 4.5 and barely worked in 4.0 (there was a beta that worked in the very first version of 4.0). It works in Windows, OSX and Linux. All the functions of MorphTools are there for creating DS native content. And sorry, but creating Poser native (cr2/pp2) based content is NOT the primary direction in DS4.5. Also, it's not the most efficient at doing so, anyway. Poser native file formats have many advantages. They have been around for a long time. There are many tools and open source scripts and even many community scripts for different 3d software packages. So if I can combine a morph combination into a new morph I can use this in many different tools and work with it. It has zero value for me to have the same functionality in Daz Studio if it can only be used in Daz Studio. Poser formats are ugly as hell, so it would be better if I could export my stuff to fbx and collada. But fbx and collada export in Daz Studio is a joke, it was even better in Daz Studio 3. I don't trust Daz anymore that they ever fix the problems with the exporters. So no, at the moment using Daz Studio only functionality is a no-go for me, at least until Daz shows commitment to fix the exporters. I have tried to install DAZStudio_4.5.1.56_Mac64 and its asking for Genesis for startup. But the location "My library" is empty. Genesis wasn`t installed at all. Previous Version 4.0.3.47_Mac64 runs without problems. The content was separated from the application - you need to isntall Genesis Starter Essentials too. I’m starting to notice an odd quirk with the libraries in daz 4.5 64 bit win version the program will randomly lose track of files in my library. It is growing so I’m betting there is some general maintenance I’m not doing I’ve tried clearing it out and letting it research for the files but that does not appear to have helped. That generally indicates a problem with the CMS...either database corruption, or if it happens with regularity, something is interfering with the running of the database server. ...all the more I just want to set up a "classic" runtime structure and forget about all this Library, Smart Content, and CMS rubbish. Why does it always seem so difficult to do things in a simple way? You still can, you don't have to use Smart Content or Categories. ..yeah even with the Library, I still find myself searching manually for items. Hence why I am in the process of setting up a custom categorised runtime structure on the new system. Just not sure where to place the basic Genesis content so as not to have any path conflicts with it or other content that "needs to be in the same location as Genesis". So if I don't intend to use the CMS or Smart Content, do I need to install the Metadata files? My understanding is that in DS4.5 you don't have to have all Genesis morphs in the same content folder, but I haven't tried it myself. The metadata files are in the main installers anyway, you don't need to run the separate ones anyway. Dunno others but this version has more crashes than .6 version, I suggest an autosave option because I've lost 3 scenes....TODAY. why a bug catcher?, submit to bug forum site, whatevah its named, takes eons to be solved! Tried the 64-bit version, but it won't work, I have a 64-bit hp xw6400 workstation with win 7 64. DS3 Advanced 64 bit works with no problems, but 4.5 pro doesn't. "This application was unable to start correctly (0xc000007b). Click OK to close the application."